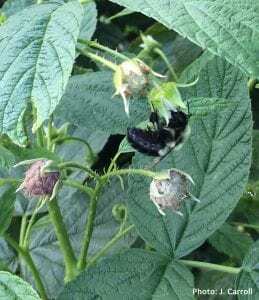 A wild pollinator feeding on a fall raspberry flower. Native, non-weedy, shrub willow blooms in early spring, a time that is critical for pollinators because of the low availability of food sources. Shrub willow supports a large diversity of pollinators that feed on its abundant pollen. Research has shown that wild bees can be an important component of crop pollination. Also, diversified landscapes that can provide a continuous availability of food sources best support this community of wild pollinators. With the decline of native bees, honey bees, and managed bumble bees, pollinator services provided by the agricultural landscape are increasingly important in the production of crops, like berries, that depend on pollination. By managing pollinator-friendly plants next to berry crops, you can enhance the services of wild pollinators and ensure adequate pollination of your berry crops, maximizing yield. the likelihood of your adopting vegetation management strategies in non-crop areas to increase pollination. Berry growers in NY — Please answer 10 questions in this brief, confidential Berry Pollinator Survey. No information will be shared without your permission. Want to try out the shrub willow to feed your pollinators in early spring and be a part of this research effort? 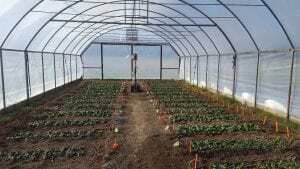 The research is currently focusing on strawberry production in NY State. Contact Eric Fabio, esf56@cornell.edu, to find out what’s possible! This post was contributed by Eric Fabio, Postdoctoral Associate, Horticulture, School of Integrative Plant Science, Cornell University. Eric is located at Cornell AgriTech, Geneva, NY. Spotted lanternfly adult on the trunk or a tree. 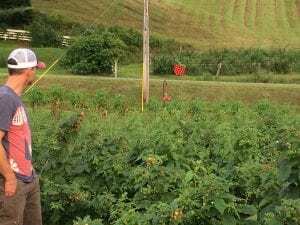 State agencies encourage the public to report findings of spotted lanternfly, an invasive pest. More details about this insect are below the press release. Following both reported cases, DEC and DAM immediately began extensive surveys throughout the area. At this time, no additional insects have been found. DEC and DAM urge New Yorkers to report potential sightings to spottedlanternfly@dec.ny.gov. 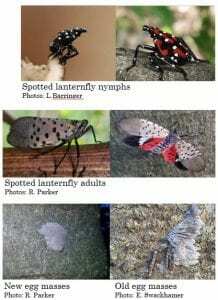 Anyone that suspects they have found SLF is encouraged to send a photo to spottedlanternfly@dec.ny.gov. SLF (photo above) is a destructive pest that feeds on more than 70 plant species including tree-of-heaven (Ailanthus altissima), maples, apple trees, grapevine, and hops. SLF feedings can stress plants, making them vulnerable to disease and attacks from other insects. SLF also excretes large amounts of sticky “honeydew,” which attracts sooty molds that interfere with plant photosynthesis, negatively affecting the growth and fruit yield of plants. SLF also has the potential to significantly hinder quality of life due to the honeydew and the swarms of insects it attracts. A Smartphone app is also available to help citizens and conservation professionals quickly and easily report new invasive species sightings directly to New York’s invasive species database from their phones. For more information, visit http://www.nyimapinvasives.org/ (leaves DEC website). 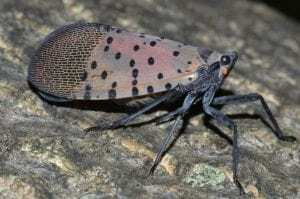 The spotted lanternfly (SLF), also known as Chinese blistering cicada, is a plant hopper with piercing sucking mouthparts. 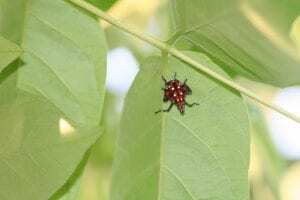 Discovered in Pennsylvania in 2014, the spotted lanternfly presents a threat to both woody and non-woody hosts that are present throughout the United States. While their list of hosts is large, the greatest agricultural concern falls on crops such as grapes, apples, stone fruits, blueberries, and hops. Its presence could lead to crop loss and increased management costs. Fourth instar of spotted lanternfly, before the adult stage. Spotted lanternfly lays eggs on any smooth and strong surface, including plant material, stones, bricks, metal, and plastic. Each egg mass contains 30-50 eggs in rows, usually covered in a mud-like substance. Spotted lanternfly may require Tree of Heaven (Ailanthus altissima) to complete all life stages; however, research is underway to confirm if SLF can use other species—such as black walnut or hops. One generation occurs per year: adults develop in July, lay eggs in September, which overwinter. The first three instars are wingless, black with white spots, while the final instars turn red before becoming adults. Both adults and nymphs commonly gather in large numbers on host plants to feed, and are easiest to see at dusk or at night. Extensive feeding causes sap to ooze from trunks and branches, and a fermented odor can occur over time. Honeydew excretions also encourage sooty mold build-up on leaves, fruit, and around the bases of trees. 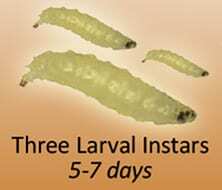 The three instars of SWD will emerge from fruit immersed in a salt solution. 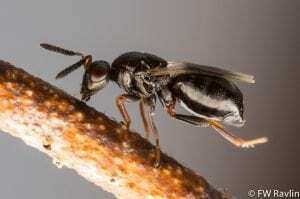 The smallest instar is about 0.5 mm long, the largest about 2 mm long. Effective use of salt flotation will help you determine if your fruit are infested with SWD and if your spray program is working. It also will give you a perspective on what your customers may find when they take the fruit home to eat fresh or to make pies, jellies, jams and preserves. I learned that variations on the salt flotation method helped a couple NY blueberry growers decide when to close this season. 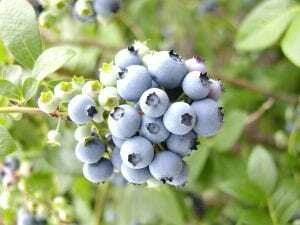 After a bad 2017 SWD season, when many NY blueberry growers suffered significant crop loss and shut down early, it was time to take action to monitor their fruit. Here are their methods. We analyze a batch of berries picked off bushes and a batch gathered that have fallen to the ground. Blueberries are collected randomly across our 5-acre patch. We test batches of 20-30 berries from these two sources separately and then compare. Mix a solution of one gallon of water to one cup of salt. Place collected blueberries in two separate, labeled bags. Slightly squeeze the berries to help release larvae. Some say to give it about an hour, but in most cases, if larvae are present, they will show up in the solution as early as 15 minutes. Of course, you will want to use a magnifying device such as a jewelers loop or magnifying glass. You will see small white larvae if infestation is present. Aug 08: negative, both from bushes and on the ground. Aug 10: negative, both from bushes and on the ground. Aug 11: positive, both from bushes and ground, but more pronounced with the latter. In 2017, at least once, fruit tested positive for berries that were on the ground, but negative when picked from the bush. The salt flotation method we use is basically the same as the method demonstrated at the SWD workshops in 2014-2015. But instead of pouring the salt solution into a low tray and visualizing larvae over a black paper with a hand lens, we pour the solution through a very fine stainless steel mesh permanent coffee filter and check for larvae under a dissecting microscope. It’s faster overall, and much easier to find the hard-to-see 1st instar larvae (probably to my detriment, since in the past I could ignore what I couldn’t see). We collect 100 berries randomly from throughout the planting. These are covered with salt solution (1 cup salt in 1 gal water) in a plastic bag. I don’t bother pressing on the berries to crack the skins as they suggest, but gave them plenty of time to exit on their own (at least an hour, usually 2 or more). Aug 13: 78% – in two days, the SWD numbers rose dramatically! 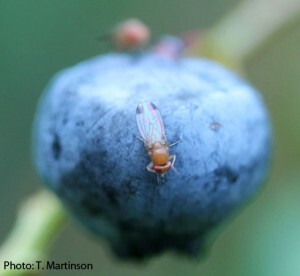 A male spotted wing drosophila (SWD) on blueberry, photographed in early September. In all cases, collect what appears to be sound, perfect fruit to test for SWD infestation using salt flotation. SWD entrance and exit holes in fruit are less than half a mm in diameter and practically invisible. I hope these two growers’ experiences using salt flotation will motivate you to monitor your fruit in this way to check for SWD infestation. There are still a lot of delicious berries out there; lets check them and protect them from this nasty insect! 2018 SWD distribution map, showing counties where traps were being monitored. As of August 9, 2018, all 35 SWD trapping sites have sustained catch of SWD in the 23 counties in New York where monitoring was taking place. 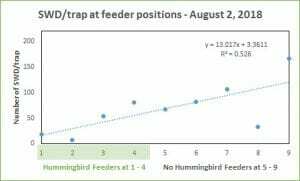 First trap catch across the New York State network spanned 72 days, from May 22 (Erie County) to August 2 (Herkimer County). All sites used the Scentry trap and lure. This year brought fewer reports of severe infestations to my attention, than in 2017. It may have been the hot weather, the hot winds, the cold nights in spring, the drought. Although we saw early arrival of SWD in 2018, there wasn’t the rapid, consistent build-up nor the early sustained catch as seen in 2017. High pressure from SWD always builds in late summer. Those of us continuing to monitor SWD in berries are catching 100-200 SWD per trap in the week ending August 28. 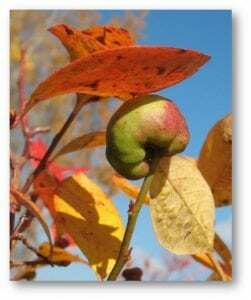 SWD is likely distributed across the state and soft, late-season fruits, such as fall raspberry, late blueberry varieties, plums, peaches, and pears may be at risk of infestation. To prevent fruit infestation now, if fruit is to remain hanging for weeks to come, susceptible fruit should be protected with an insecticide program. rotate active ingredients—read and follow insecticide label directions. Find out more about SWD on the Cornell Fruit Resources SWD pages. Please join me in thanking those who contributed time and effort to the 2018 SWD trap network! This Wednesday! 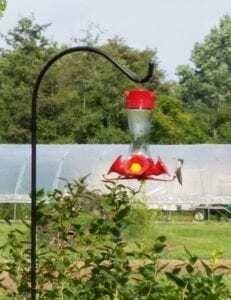 “Using Hummingbirds to Help Control SWD” — a twilight meeting in Salem, NY hosted by Laura McDermott, Eastern NY Commercial Horticulture Program (ENYCHP). Biological and cultural controls of SWD are possible! Now that SWD numbers are increasing, every tactic used will help protect your late season berries. Come learn about ongoing research into encouraging hummingbird predation on SWD adults. Dr. Juliet Carroll of Cornell NYS IPM will also discuss new research into better thresholds for monitoring SWD and how those thresholds will more accurately inform spray decisions. Managing crop canopy and weeds are also critical for SWD control. If you don’t want to spray, ENYCHP will have current information on exclusion netting work over berries, so you can plan to cover your crop next year. 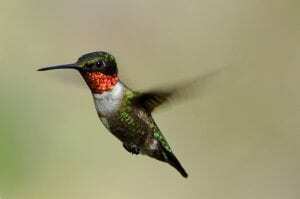 Hummingbirds eat lots of small insects, including aphids and fruit flies, to supplement their nectar-rich diet. Up to 2000 per day! 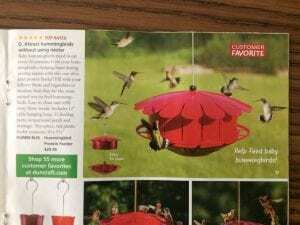 More about hummingbirds is in the Hummingbirds SWD blog post.